The weekend of August 8 & 9th is shaping up to be the best weekend of music on Salt Spring Island this summer thanks to the Salt Spring Garlic & Music Festival. Featuring an international group of performers joining forces with top-notch local talent for two days of incredible entertainment, and garlicky good fun on Paradise Farm. Come and enjoy both the music and the food on a beautiful rural location with breathtaking views of the ocean. Featuring the sounds of BC rock royalty Chilliwack, Vancouver favourites The Boom Booms, globally renowned Ganga Giri, and Juno winners, Valdy, Shari Ulrich, Rick Scott, and Roy Forbes. Look forward to a weekend of musical entertainment and relish cooking demos, garlic tasting, and visit farm vendors on site. Over two-dozen will be selling organic produce, as well as a dozen varieties of local Salt Spring garlic. Come hungry as you’ll find everything from locally made ice cream to kettle corn, and garlic popsicles. On the heartier side food vendors will supply pulled pork sliders, burgers, fish tacos, lamb sausages, falafels, poutine, fries and Greek food. Festival attendees can take in wine tastings and imbibe in the beer garden. Tickets are on sale now for $30/day or $50 for a weekend pass (plus fees). Proceeds will help strengthen the local music scene, and support area farmers. Come experience a festive atmosphere, and great tunes on a picturesque, rural setting. Organizers of the Salt Spring Garlic and Music Festival want to treat a Miss604 reader to VIP weekend passes to the festival. The winner will enjoy transportation to the site and once there receive a mystery basket full of Salt Spring goodies — and yes there will be garlic! 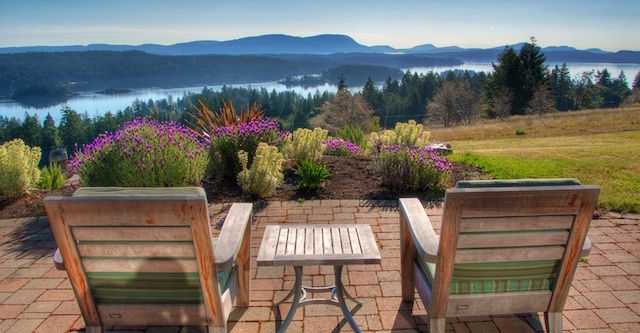 Miss604 readers also have the opportunity to win two nights of luxury at one of Salt Spring’s most spectacular accommodations, the Stonehouse Bed & Breakfast. Discover the epitome of West Coast comfort and elegance. Stonehouse offers an unparalleled Salt Spring Island experience set against a dazzling tableau of British Columbia’s Southern Gulf Islands. Over 4 acres of stunning property beckon to be explored, including tree-lined lanes, gardens, rolling hillside and the magnificent Standing Stone Circle, which renders tangible: stillness, endurance and mystery. Adorned with a diverse collection of art and other objects that pique curiosities and start conversations, Stonehouse provides a distinctive ambiance for the discerning traveller. Graceful hospitality and myriad leisure activities allow guests to relax in their home-away-from-home, while gourmet breakfasts featuring the amazing bounty of local producers tantalize the senses. To enter to win the two night luxury stay, share this post on Facebook, tagging Salt Spring Garlic and Music Festival + Miss604. The Stonehouse winner will have to claim their prize any weekend from October 1 to April 15, 2016, based on availability of accommodation. Blackout in effect during long weekends. The winner will also agree to be disclosed and do any follow-ups via social media. I will draw two winners (one for the VIP festival prize pack + one for Stonehouse) at 10:00pm on Thursday, July 23, 2015. Follow the Salt Spring Garlic and Music Festival on Facebook and Twitter for more information. Update The winner of the tickets is Doreen! The winner of the stay at Stonehouse is Mark Linden O’Meara! I’m still dancing from the last time I saw THE BOOM BOOMS!!! Salt Spring Coffee… yes, please! Hi,the Boom Booms are playing! Also it sounds like an awesome event! Boom Booms are awesome! Thankyou! I like garlic and 40 Roses. I’d love to enjoy fresh garlic from Berry Hill Farms, or any of the other great farms. The performers KUNDA look amazing! It would be most excellent to see them live! Nothing wrong with some Chilliwack…. This is 2 days after a big exam for me!! What an amazing way to relax! salt spring island kettle corn is the best! Roy Forbes all the way!! Salt spring island kettle corn! Would love to hear Valdy again ! Loads Of Garlic to Eat! Auntie Pestos Café. Lamb Wrap. Garlic Mayo. Mouth watering. Boyfriend loves Chilliwack! Would be awesome to treat him! Would love to win, it’s our 4 year wedding anniversary today! Chilliwack will be performing at the festival. Would be fun to see the Boom Booms!